It was in January 1944 that I boarded the infantry landing ship Empire Broadsword in Scotland with Royal Marines 538 Assault Landing Craft Flotilla in preparations for the D-Day landings. 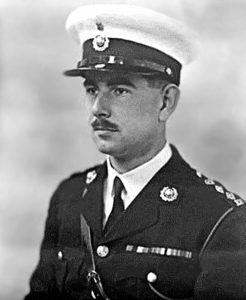 As a Royal Marines lieutenant on D-Day I had command of nine LCAs (landing craft assault), each manned by four marines and carrying thirty soldiers in the first wave of the assault on SWORD beach. At 400 metres from the beach we disembarked the troops in shallow water without loss. We were returning to Empire Broadsword when I was asked to ferry ashore one of the beachmasters and his party whose LCA had been wrecked. We finally dropped anchor back in the Solent at 2230 hours on 6 June. Empire Broadsword made four successful crossings to the beaches but then on 2 July 1944, as we were returning from our fifth crossing, we struck two mines almost simultaneously. I was on my bunk and was thrown on the ground. I knew something serious had happened. The ship was sinking at the stern. Going towards the stern of the ship, I passed Sub-Lieutenant F W Wheatley RNVR (responsible for the maintenance of the LCAs) who at the moment of the explosion had been shaving and the sink had smashed against his chin, causing him serious injury. I helped him off the ship but several days later I learned that he had died. I found myself on the starboard side. There were no longer any life rafts, lifeboats or LCAs, the majority having been destroyed in the explosions. As the ship’s stern submerged, one of the LCAs was trapped under its davit and it was from this davit that I jumped into the water. I was one of the last people to leave the ship, but before jumping I returned to my cabin. I collected a sack of photographs of the flotilla, my Bible which I still possess and two tennis rackets which I threw into an LCA (never to see them again). During this time I passed two other people: Father Chatterton, the RC Priest who had come to fetch his communion set from his cabin and Captain Patchett who had retrieved a photograph of his wife. My friend Corporal Frank Warren had to jump from the bow on the starboard side, by now a height of some ten metres. The Captain, who was the last to leave the ship, couldn’t swim but was able to get into a boat sent to collect survivors without getting wet. We all carried life jackets which could only be inflated once we were in the water for fear they might not function. I sank for two metres and then returned to the surface, inflated my life jacket and tried to distance myself from the ship as quickly as possible in case I was sucked down by the ship as it sank. The Empire Broadsword took only twenty minutes to disappear and most of us were transferred to the Empire Battleaxe.